Don’t get too excited about GoPro’s latest round of layoffs. Shares of GoPro (NASDAQ:GPRO) surged 16% on March 16 after the action camera maker released preliminary first quarter figures and announced another round of job cuts. For the first quarter, GoPro expects its revenue to rise 3.5% to 14.4% annually, which would represent its second straight quarter of year-over-year sales growth. GoPro plans to slash 270 jobs in its third round of cuts, which follows the 100 layoffs it announced last January and 200 more it announced last November. Those three rounds will reduce its headcount from 1,500 at the end of fiscal 2015 to just 930 -- with most of the cuts targeting its virtual reality, media, and broadcast divisions. GoPro's Hero 5 Session and the original Hero Session. Image source: GoPro. Some analysts believe that GoPro's sales growth and belt-tightening indicate that the stock could finally be bottoming after its 80% plunge over the past two years. Citi recently upgraded the stock from Sell to Neutral, noting that those factors would accelerate its timeline for profitability. However, I believe that GoPro's turnaround is hardly a sure thing, and investors should still avoid this volatile stock. If GoPro hits the midpoint of its estimates and its first quarter revenues rise 9% annually to $200 million, it would still be weak compared to its previous quarters. During the first quarter of 2016, GoPro's revenue of $183.5 million mostly came from the poorly received Hero 4 Session and three lower-end devices which were discontinued last April. The company didn't sell any new flagship devices during that quarter. But for the current quarter, GoPro is selling a new flagship device, the Hero 5 Black, a smaller variant, the Hero 5 Session, and the older Session. It's also selling the new Karma drone, which it relaunched in early February after a disastrous holiday quarter recall, as well as the Karma Grip handheld stabilizer and its high-end Omni and Odyssey VR rigs. After selling all these new products, which weren't on the market a year ago, posting 9% annual sales growth hardly seems like a major accomplishment. Can GoPro achieve sustainable profitability? GoPro CEO Nick Woodman claims that the company's layoffs will lift its bottom line back to non-GAAP profitability. Investors should note that Woodman didn't say anything about GAAP-based profitability, which it last achieved during the third quarter of 2015. Woodman believes that the new job cuts and program cost reductions could cut annual operating costs by $200 million. 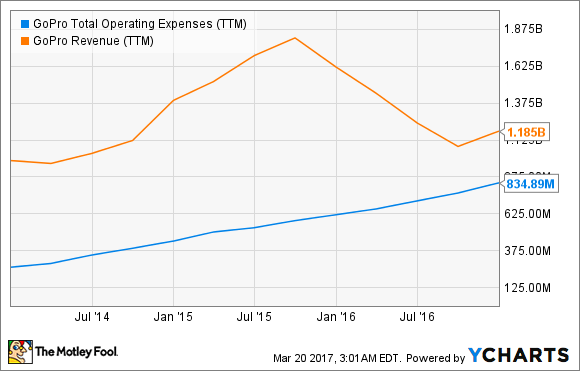 But if we compare GoPro's operating expenses to its revenue growth since its IPO, we'll see that cutting $200 million from expenses barely offsets its slowing revenue growth. Prior to GoPro's announcement, analysts were expecting the company to post non-GAAP losses in both fiscal 2017 and 2018. Cutting costs by $200 million might help GoPro climb back over the break-even point, but it won't be sustainable without solid revenue growth -- and analysts expect its sales to rise just 7% in 2017 and 3% in 2018. Downsizing could also dull GoPro's competitive edge, which could be fatal as the company faces cheaper competitors in the action camera market -- many of which use similar Sony image sensors and Ambarella image processing SoCs as GoPro's pricier cameras. GoPro also still hasn't responded to the growing niche market of stand-alone spherical cameras for 360-degree and VR videos. Samsung's (NASDAQOTH:SSNLF) Gear 360, for example, lets users record those next-gen videos with a single $350 camera which is barely heavier than the Hero 5 Black. Samsung's Gear 360. Image source: Samsung. GoPro's cheapest comparable solution, the six-camera Omni, costs a whopping $5,000. Samsung's Gear VR headsets, which are tethered to the Oculus ecosystem, also lets users view their own 360-degree videos. Since GoPro doesn't produce a comparable headset, its videos must be viewed in a headset running YouTube or its GoPro VR app. The Omni and Karma drone both demonstrate GoPro's ill-advised strategy of selling all its products as "accessories" for its action cameras. Whereas DJI's Mavic Pro has a built-in camera, GoPro sells the Karma as a flying mount for its action cameras. Unless GoPro produces new products that aren't aimed at boosting camera sales, it will likely keep struggling as its core market is commoditized. Contrarian investors might find something to love about GoPro, but I'm not buying its turnaround strategy yet. Plenty of dying hardware companies followed this same doomed path of downsizing while haphazardly expanding into adjacent markets before. Therefore, investors shouldn't chase GoPro's rally unless the company can demonstrate that its cameras and drones can stand out in both crowded markets.